The poster paper of the AfricaYam project on “Yam anthracnose phenotyping” was adjudged the best poster of the 18th Triennial Symposium of the International Society for Tuber and Root Crops (ISTRC) held 22–25 October at Cali, Colombia. The poster was presented by Olufisayo Kolade, Postdoctoral Fellow and Yam Disease Phenotyping Specialist in the AfricaYam project and in the Virology & Molecular Diagnostics Unit, IITA-Ibadan. 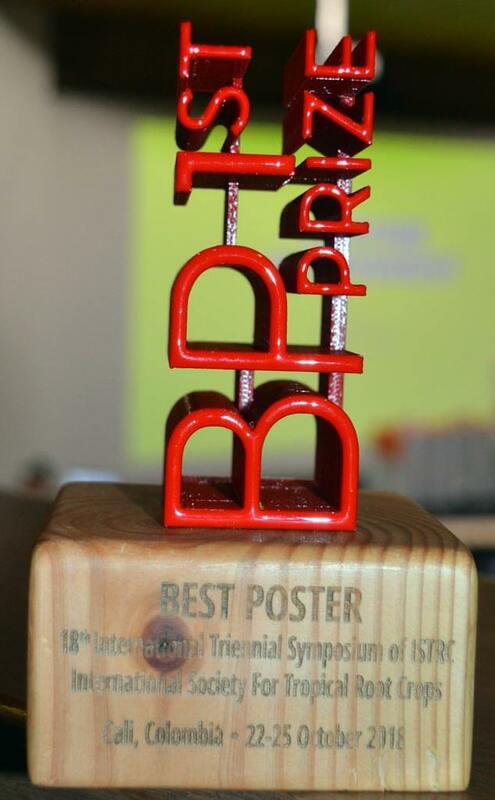 The trophy for the best poster of the 18th Triennial Symposium of the International Society for Tuber and Root Crops (ISTRC). The paper titled “High-throughput yam anthracnose phenotyping using detached leaf assay and digital imaging” presented a new phenotyping method established for assessing yam (Dioscorea spp.) germplasm and breeding lines for yam anthracnose disease (YAD) caused by Colletotrichum gloeosporioides resistance. 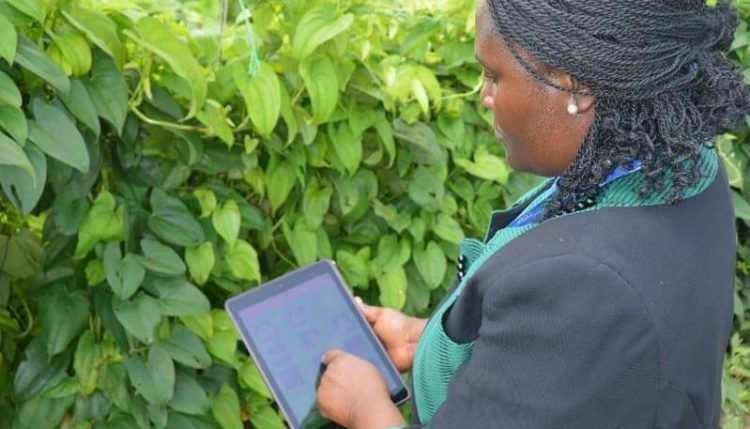 “This work funded by AfricaYam allows assessment of the performance of yam genotype against YAD under 3 weeks and up to 100 genotypes can be assessed in a week, allowing simultaneous gathering of data on host–pathogen interaction,” said Kolade who led the development of this procedure. 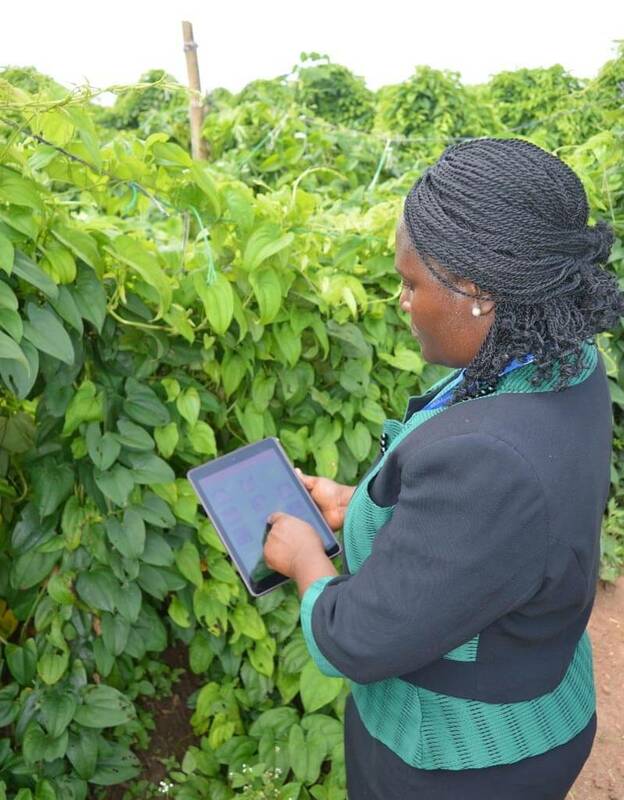 Dr Kolade in the field with the ‘Leaf Doctor’ App. IITA Head of Virology and Germplasm Health Lava Kumar congratulated Kolade for this success and added that the ‘DLA-Leaf Doctor’ innovation facilitated the much needed high-throughput phenotyping pipeline necessary to accelerate breeding for YAD resistance in water yam. AfricaYam Project Leader Patrick Adebola, also cited Kolade for the achievement added that AfricaYam is paving the way for new innovations on biotic stress phenotyping to fast track development of molecular breeding tools and yam breeding in West Africa.